Babel Restaurant is situated on the beautiful Babylonstoren Estate just outside Franschhoek in the Cape Winelands of South Africa. to try our tasty yet often unconventional combinations. We have a “farm to fork” philosophy at Babel which means that we like to serve food that is seasonal and that reflects our “pick, clean and serve” approach. 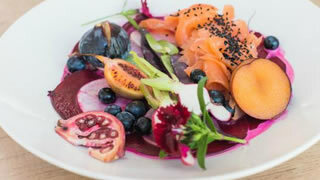 The menu at Babel Restaurant Franschhoek is always seasonal and is guided by what is in the garden – we encourage guests to explore our gardens during the day. Our food always reflects the season and so in summer we may serve you a yellow salad of pineapple, gooseberries, granadillas, yellow tomatoes and apricots while in winter a slow-cooked leg of lamb in red wine is more likely. While our meals are creative, we don’t like to tamper unduly with our food. Restrooms at Babel Restaurant are wheelchair friendly. Kindly note that all pathways on the Babylonstoren farm are gravel and covered in peach pips in some areas of the garden.